Event #52: $25,000 No-Limit Hold'em (Six Handed) is one of the premiere events at the 44th annual World Series of Poker, and whoever reigned victorious after Day 3 would not only gain over $1.2 million and a gold bracelet, but also respect from their peers for outlasting one of the toughest fields of the series. In the end, it was Steve Sung besting Phil Galfond heads up for the title. Sung now has over $4.6 million in career tournament earnings to go along with two career WSOP gold bracelets. Galfond, who was looking for number two as well, will have to settle for the $744,841 second-place prize. The third and final day began with 18 players, and leading the way was German Max Lehmanski. With the bubble bursting at the conclusion of Day 2, there were a flurry of early eliminations, and with exits from Christian Harder, Fabian Quoss, Marvin Rettenmaier, David "Bakes" Baker, Igor Kurganov, Todd Terry, Kevin Eyster, and others, play quickly reached an unofficial final table of seven. There, the chip lead was exchanged by Sung, Dani Stern, and Phil Galfond. After nearly two-and-a-half hours, Shannon Shorr called all in with an ace-high flush draw against Galfond, who had flopped top pair. The turn and river both produced bricks, and the official final table was set. After nursing a short stack for hours, Richard Lyndaker exited in sixth place. Lehmanski followed him out the door right before dinner break, busting in fifth place when he three-bet shoved with two sixes. Galfond, the original raiser, snapped it off with aces, and held. After the dinner break, Galfond extended his chip lead, while Brit Stephen Chidwick started to slip. He was then eliminated in fourth place by Stern, despite getting his chips in with a dominating hand. Chidwick was in great shape to double with two sixes against Stern's two fives, but the river was a five, and Chidwick was off to the cage to collect over $350,000. Three-handed play lasted 26 hands, and while Sung snatched the chip lead away from Galfond and started to pull away, Stern got shorter and shorter. He moved all in with ace-five over a raise from Galfond, who instantly called with two queens. The queens held, and the only two bracelet winners at the final table were suddenly heads up. 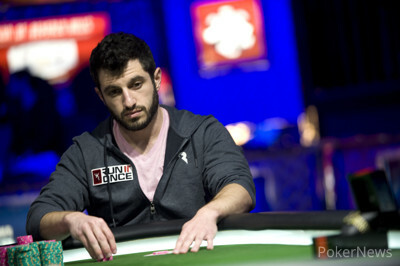 Galfond battled back to regain the chip lead, and then the two played in an epic pot at the end of Level 28. On a queen-high, rainbow board, after check-raising to over a million on the flop, Galfond led out for a massive, 2.5 million-chip pot. Sung clicked it back, raising to five million, and Galfond nearly shoved with four-high. He thought better of it, and Sung showed a ten for a pair of tens. We will never know what Sung would've done had Galfond moved all in - Sung only had around 1.77 million behind - but after the hand, Sung said he would've called. Eight hands later, it was over. Galfond three-bet shoved with king-queen, Sung snap-called with jack-ten, and Sung flopped bottom two against Galfond's top pair. The turn and river were both bricks, and Sung was crowned the champion. 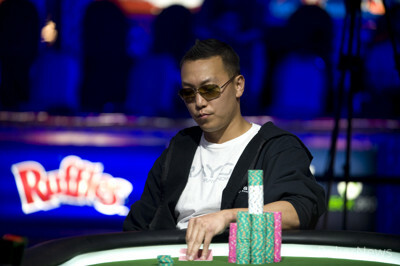 Congratulations are in order for Sung, a now two-time WSOP bracelet winner. We'd like to thank you for following the coverage of this event, and we hope to see you again for ongoing coverage through the Main Event. Good night from Vegas! Hand #125: Phil Galfond raised to 250,000 on the button, Steve Sung called, and the flop fell . Both players checked. The turn was the , Sung led out for 300,000, and Galfond folded. Hand #126: Galfond received a walk. Hand #127: Sung received a walk. Hand #128: Sung raised to 240,000, Galfond moved all in for about 2.24 million, and Sung snap-called. The flop was a doozy: . Sung picked up bottom two pair, but Galfond had top pair, an open-ended straight draw, and a backdoor flush draw. The on the turn extinguished all hopes of a backdoor flush dor Galfond, and it was all over when the completed the board. 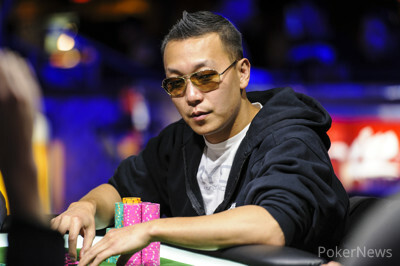 Galfond will receive $744,841 for his runner-up finish, while Sung is now a two-time bracelet winner. Hand #121: Phil Galfond raised to 200,000, Steve Sung three-bet, and Galfond folded. Hand #122: Sung raised to 250,000, and Galfond folded. Hand #124: Sung raised to 225,000, Galfond called, and the flop fell . Galfond checked, Sung immediately bet 250,000, and Galfond called. The turn was the , Galfond checked again, and Sung flung out another 400,000. Galfond called. The completed the board, Galfond checked a third and final time, and Sung fired a third and final bullet worth 1.225 million. Galfond grimaced at the sight of the bet, then turned his attention to Sung. He finally called, then mucked when Sung showed for a full house. Hand #118: Steve Sung raised to 200,000 on the button, Phil Galfond defended, and the flop came . Galfond check-called a bet, and the turn was the . Galfond checked again, Sung fired out 600,000, and Galfond folded. Hand #119: Galfond gave Sung a walk. Hand #120: Sung raised to 250,000, Galfond called, and the flop fell . Galfond checked, Sung continued for 300,000, and Galfond check-raised to 1,075,000. Sung called. The turn was the , Galfond tanked for two minutes before sliding out 1.25 million, and Sung clicked it back, min-raising to 2.5 million. Galfond asked for a count, Sung cut down his stacks to show that he had 1.775 million behind, and Galfond tanked for nearly seven minutes before folding. 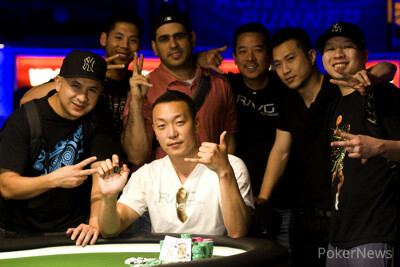 Hand #110: Steve Sung raised to 200,000 on the button, Phil Galfond three-bet to 575,000, and Sung folded. Hand #111: Galfond limped in, Sung raised, and Galfond called. The flop fell , and Sung check-folded to a bet from Galfond. Hand #112: Sung raised, and Galfond folded. Hand #113: Galfond raised to 200,000, Sung three-bet, and Galfond folded. Hand #114: Sung raised and won the pot. Hand #115: Sung received a walk. 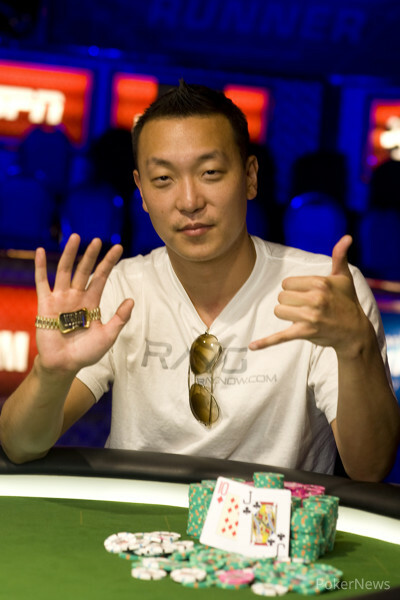 Hand #116: Sung won with a bet on the flop. Hand #117: Galfond limped in, Sung raised to 400,000, Galfond re-raised to 1,050,000, and Sung called. The flop fell , both players checked, and the turn brought the . Sung checked, Galfond fired out 875,000, and Sung called. The , Sung quickly checked, and Galfond checked behind. 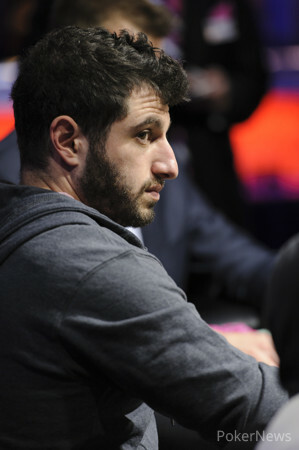 Galfond showed for a pair of sevens, winning the biggest pot of heads-up play.